Welcome to the AMATS Bicycle Plan Implementation Project Interactive Map! This map displays bicycle infrastructure improvement projects that are currently assessed for possible design and construction in 2018-19 throughout Anchorage and Eagle River. Proposed projects are a combination of bicycle infrastructure improvements such as Bike Boulevards, Bike Lanes, Shared Roads, and Shoulders. 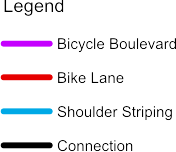 By clicking on a specific project (shown in the red and green lines on the map), you’ll be able to see the name of the road, the agency owner of the road, the anticipated construction year, and the type of bicycle facility that has been recommended for that project. 1.Zoom and pan the map to find a location. 2.Click on the project symbol for details. 3.Add a comment if desired.